Mahmoud Abbas says he is ready for a new round of peace talks with Israel. Abu Dhabi, United Arab Emirates (CNN) -- Palestinian Authority President Mahmoud Abbas says he is ready for a new round of peace talks with Israel, but he harbors a jaded view of the exercise. In an interview with CNN Monday, Abbas said he will be grappling with an Israeli government he calls "radical and stubborn" and even promises to end talks If Israel builds more settlements. "We have (a) very hard time in convincing the Israeli administration of the need to withdraw from the territories, the need to solve the Jerusalem issue and the situation involving the refugees," Abbas said in Abu Dhabi. "If you remember, during the previous meetings, we informed the U.S. administration that we agreed on what they called the proximity talks. But what happened was that Israel provoked the U.S. administration and roused all of us by announcing their plan to build 1,600 settlements in Jerusalem." Over the weekend, the Arab League endorsed indirect or "proximity" peace talks between the Israelis and Palestinians, a development welcomed by Israeli Prime Minister Benjamin Netanyahu. It is unclear if and when the talks would start. "Until this moment, we can't say that it will start but there are indications," said Abbas. "These indications started when the American administration offered commitments or let's say assurances that there will not be any acts of provocation during these talks. "We accepted this assurance and we went with that to the Arab League, to the Arab League peace initiative committee and they endorsed it." Procedurally, the Palestine Liberation Organization's executive committee needs to approve the start of negotiations, and Abbas said negotiations will begin when the Palestinian leadership gives its go-ahead. He expects to meet Friday with George Mitchell, the U.S. special envoy to the Middle East. Abbas -- who said the United States is the only broker of talks -- said he will inform Mitchell of any Palestinian decision regarding talks. 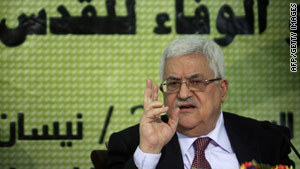 If talks are approved, they will be held in the time and manner proposed by the envoy, Abbas said. Water, borders, the settlements, the refugees, Jerusalem, security and Palestinian prisoners are issues that must be on the agenda, he said. Abbas said the talks will end if Israeli settlement-building continues or restarts. Abbas envisions two states based on the pre-war June 1967 borders with some changes that would lead to an agreement. "Let us talk about the vision of the two states. What does it mean to have a two-state solution?" he said. "Israel needs to stop these activities and not push us to face their reality on the ground where they keep claiming that it is their land." He said the issue of Jerusalem is key. "All of the international entities say that East Jerusalem is an occupied territory, therefore East Jerusalem is the capital of the state of Palestine,"
Asked what would happen if the new negotiations fail, he said "will have to reassess." Abbas is hoping that the United States can foster good relations with both the Israelis and Palestinians and help them move forward. "I don't want bad relations between the U.S. and the Israelis. I want a good U.S. relation with Israel and Palestine that can have its say." Asked whether Palestinians can negotiate when there is much disagreement between them, with Hamas controlling Gaza and Fatah prevailing in the West Bank, Abbas said he speaks "on behalf of all of the Palestinians." "Let us not talk about things before they happen. I represent the PLO and the PLO talks on behalf of all the Palestinian people in the West Bank, Gaza and abroad. They are the one entitled to sign treaties with everyone." When asked whether Hamas would reject Abbas' stance, he said it wouldn't. "This is what every Hamas official says: that the PLO is the one who is responsible when it comes to the negotiations. This is why I can go ahead with the negotiations and I don't have to wait for a final national reconciliation with Hamas." Asked how Palestinians can control rockets being launched by militants into Israel, Abbas said, "There are no rockets." "Hamas reached an understanding that the rockets are wrong and that the rockets are not a national act," a stance he calls a "very good thing." "There are no rockets and I can say it in all honesty that there is no true military resistance anymore," he said. Abbas said he doesn't support any idea of unilaterally declaring a Palestinian state. "There is no use for us to declare a state and be alone and the result will be that it will not be recognized by all the countries all over the world."